My name is Rosie. 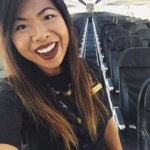 I am a flight attendant and I’m loving every second of it. I feel super lucky to be given some incredible opportunities to see the world and meet some of the most amazing people. My friends will tell you I’m a complete kid at heart and my sister will tell you I’m the biggest boy band nerd you’ll ever meet. PROUD OF IT.